Most readers are quite familiar with the harrowing tale of the young woman who meets with danger in the woods, so much so that one hardly need name that infamous Red Riding Hood tale. The cheeky children’s writer, Roald Dahl, can be counted among the knowledgeable. Apparently enough of a fan to create his own version- turning the tale on itself and transforming it from the saga of an innocent maiden thrust into the unknown to be a victim of beastly predator -into a poem of the trials and triumph of a girl turned heroic woman. Gone are the great danger of the wolf and the passivity of Little Red. Gone, even, is “Once upon a time.” Instead Dahl transforms the fairy tale itself, through both the presentation and modernization he has refreshed the story into one of initiation and triumph one that blurs the line between the real and fantasy breaking the rules of the otherworld. Red Riding Hood is no timid victim but a heroine brandishing a weapon. Dahl goes about sculpting the story into a rousing adventure using a rhythm that is fast paced and exciting with the order of the words “The small girl smiles. One eyelid Flickers” building anticipation. This particular approach has a notably modern tone. 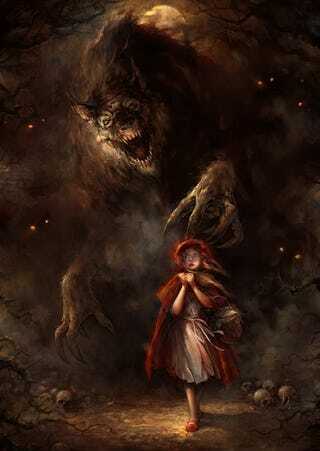 In the common variations of Red Riding Hood the author implies that Red Riding Hood is frightened and uncertain. She is naïve and passive and the tone is sinister or restrained. Here, however, our victim is in control and one must wait a beat to discover the source of this knowing smile. Though we still have the “girl”, the immature and uninitiated female youth, as protagonist for this telling she is unafraid and daring. Unlike the girl child of the past, a modern girl is aware of danger and is expected to recognize it in order to protect themselves and so then is Red Riding Hood constructed. In the very next line “She whips a pistol from her knickers. She aims it at the creature’s head” Dahl has entirely altered the demure and gentle version of the girl child but maintains the significance of the actions which bring her ever closer to womanhood. So much of this brief portion speaks great volumes about who this Red Riding Hood is. This is a girl in “knickers”-undergarments not worn until the late 19th century and whose introduction was met with some controversy- and carries a pistol – an item found as far back as the 16th century but a rare device for any folktale. And she “whips” it out! This juxtaposition of the girl with the fancy undergarments, possessing great energy and comfort discharging such a phallic weapon is at once an acknowledgement of the classic and change to the modern. And is a rather brilliant way of stripping her childhood without denying her agency. One must also note that Wolf has somewhat altered, though still accepting the essence of the wolf “She aims it at the creature’s head” as an otherworldly element Dahl manages to blur the line a bit. This scene encapsulates the very heart of Red Riding Hoods tribulations with Wolf already inside, ceremonially dressed in Grandmother’s clothes and Red Riding Hood breaking the taboo of speaking with a stranger in the intimate setting of a bedroom. In addition to the danger of navigating this situation correctly lest she become victim and lose all that is virtuous and good. But, what Dahl does here is bring the outside in and places Wolf at the mercy of the realistic world that Red Riding Hood inhabits. It is Wolf now who must navigate correctly or his life is forfeit. Further, Wolf’s knowledge of how the conversation is supposed play out as he prompts Red Riding Hood for her part “That’s wrong!” cried wolf and the observation “have you forgot to tell me what BIG TEETH I’ve got?” stands as a reminder that the tale has ceased following its proper path. Dahl is winking at the audience here and implies that the characters know the quite well having lived it so many times before. Our Wolf is over confident and assures Red of his success “Ah well, no matter what you say, I’m going to eat you anyway.” The audience is reminded of Wolf’s pomposity and security. The danger posed by Wolf is limited to the classical variation of the story, he poses no threat to Riding Hood’s virtue but he is unaware that the world has been turned upside down. Few more paragraphs to write regarding the second portion of the passage and I'll be done. Thank you. Thank you. Thank you. A thousand times Thank You.